How do you know if a job is right for you? Try it out—Intern at EIA! Internships at EIA provide an excellent opportunity for college students to gain professional work experience and make key contacts in the energy field and the Federal government. 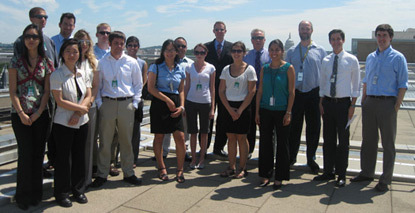 EIA offers summer internships opportunities to students from a variety of academic disciplines, particularly for those with majors in areas such as Economics, Mathematics, Statistics, Engineering, Operations Research, Business/Finance, & Web Development. Duties and responsibilities will vary according to internal program office assignment and can range from challenging tasks such as assisting with data analysis & forecasting, developing and designing modeling systems, surveys or reports, researching trends and issues in domestic and international energy markets, to participating in website design and development. In some cases, you can probably earn school credit, too.